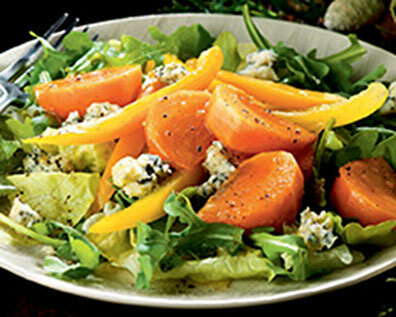 Persimmon and Blue Cheese Salad with Meyer Lemon Dressing . . . Seasonal ingredients Meyer lemons and persimmons brighten up this winter salad, making it the perfect refreshing starter to a rich, comforting meal. This works nicely with persimmons that are quite firm, like an apple, or a little on the softer side (the flesh yields to gentle pressure when squeezed). The skins are a bit tough so peel them away with a vegetable peeler or paring knife before cutting the wedges. If you prefer to skip the blue cheese, other nice additions include toasted almonds, hazelnuts or green pumpkin seeds. 1. Whisk together lemon zest, juice and sugar in a bowl. Gradually whisk in olive oil, then season with salt and pepper to taste. 2. Pour half of the dressing over arugula and lettuce in a large bowl and toss gently to coat. Add persimmons to remaining dressing and toss to coat. 3. Arrange greens on plates, sprinkle overtop with peppers and blue cheese, then top with persimmons and drizzle any remaining dressing overtop.